World leaders will meet in Paris from 30 November in a bid to secure an agreement to limit global warming to no more than two degrees above pre-industrial levels. While that deal, the cornerstone of the bloc’s negotiating position in Paris, is a step in the right direction, the European Union has long battled with the problem of poor implementation of its environmental laws. But regions are increasingly picking up the slack. Through organisations such as the Committee of the Regions and initiatives like the Covenant of Mayors, regional authorities are directly communicating with EU policymakers about how best to fight climate change. There are also communicating with each other, sharing best practice and innovative ideas to deliver real change. Such moves have made it possible for many EU cities to reduce their CO2 and boost renewables and energy efficiency, even more than targets handed down from Brussels in the past. The greater engagement at local level on climate change makes perfect sense. While national government may hand down some policies, it is at regional level that they will be implemented. Some cities have the autonomy to wield ambitious new policies with multiple benefits. There are regions that are literally on the frontline of the fight against climate change and will suffer terribly if global warming isn’t curbed. City planners can improve the environment and their citizens’ quality of life through imaginative transport and mobility policies. And leaders can create local jobs and stimulate the economy by incentivising green projects and start-ups. At the same time, it will fall to them to ensure that workers in carbon-intensive industries are not left behind, as the EU moves to a low-carbon economy. While EU and international leaders have in the past struggled to deliver agreement on how best to fight global warming, regional authorities in Europe have forged ahead. Cities and regions often commit to go further than the targets set at other levels of government. A declaration on energy efficiency and renewable energy was signed on 7 December 2006 at a round table organised in Brussels by the Committee of the Regions, the European Federation of Regional Energy and Environment Agencies and the Assembly of European Regions. The declaration includes a series of separate pledges made by individual regions. Examples include a commitment by the Kalmar County Council in Sweden to be "totally fossil-fuel free by 2050 or earlier" and a commitment by the Navarra region in Spain to have 75% of its electricity produced from renewable energy sources by 2010. That tradition is continued in the Covenant of the Mayors agreement. By their commitment, the 6,565 signatories aim to meet and exceed the European Union 20% CO2 reduction objective by 2020. Investment in renewables and energy efficiency projects, such as housing renovation, can also create jobs and growth, making them more attractive to city leaders. 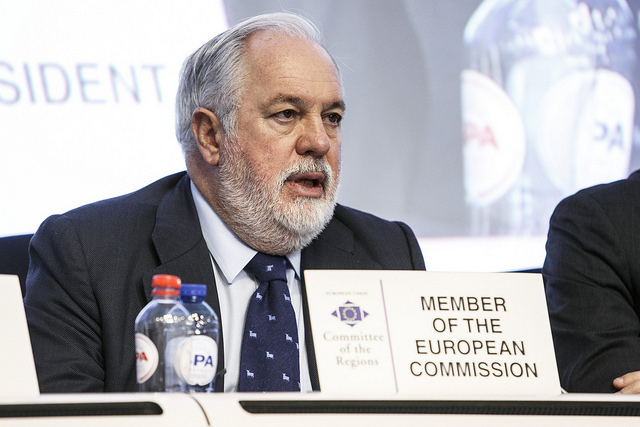 In October 2015, Climate Commissioner Miguel Arias Cañete told representatives of Europe’s cities and regions to focus their climate change efforts on energy efficiency and especially the renovation of buildings. Cañete was speaking at the plenary session of the Committee of the Regions in Brussels and called on local leaders to put energy efficiency first in their policies. “Cities are at the heart of the fight against climate change,” he said, “it’s where most of us live and where most of our energy is consumed”. 75% of homes in the EU were inefficient, he added, and smart renovation could cut up to 40% of the bloc’s energy consumption. “We can make considerable gains […] energy efficiency has an important role to play in the achieving of our climate goals in the EU and globally,” he said. There are some stirring examples of authorities breaking new ground. The Danish island of Samsø, for example, is the world’s first 100% renewable-energy powered island. But there is always the risk that the good work of regional leaders can be undercut by national policy. The British government recently cut subsidies to wind and solar, causing the collapse of a number of local companies. Regional authorities are increasingly in the driving seat of the fight against climate change, using their transport and mobility policies to drive down emissions. Local leaders often have the autonomy to make decision that can shrink their cities and regions climate footprints. While this can include public transport, it also encompasses initiatives to encourage green mobility such as cycle pathways or information campaigns. Transport is one of the largest contributors to carbon emissions, which contribute to global warming. It is the second biggest contributor after the power sector, with cars making up the single largest source of emissions. A recent report by the European Environment Agency found that from 1990 to 2013, the European Union managed to reduce its emissions by 19.8%. Over the same period, transport was the only sector which increased its emissions. They rose by 19%. Transport doesn’t just push up global temperatures, its contribution to air pollution can also have a negative impact on health. Despite this, the European Commission is yet to outline its strategy to decarbonise the transport sector. While the bloc’s Energy Union project, launched on 25 February 2015, did nod to the necessity of decarbonisation, it was light on detail. In 2016, the executive is expected to launch a communication on bringing down CO2. Officials are undertaking a review of its white paper on transport that will feed into the communication. In the meantime, cities and regions have taken control of the issue. While this is down to their commitment to the environment, it is also thanks to the EU’s push to encourage states to divest from the transport sector and liberalise their markets. Regional leaders have stepping in to fill the gaps in intercity transport, particularly in rail. The Covenant of Mayors is an initiative bringing together regional leaders and encouraging them to share best practice in implementing environmental policies. Unsurprisingly, transport is a major issue. The Do the Right Mix initiative pushed for citizens to use a variety of different ways to get around. This multimodality is seen as key to not only cut emissions, but also reduce congestion – a real win-win. Regional leaders, thanks to their close proximity to citizens, are in a unique position to drive change and secure support for measures such as car-free days, or car-pooling, or introducing congestion charges. Of course, investment is needed. One source, separate to funding from national governments, is EU funding. New rules adopted as part of the 2013 European budget state that wherever European funds are used to supplement regional investments in transport, the projects must meet high environmental and biodiversity protection standards. In order to access these finances, regions have to carry out impact studies and rectify any problems their new infrastructure might cause to flora and fauna. Procurement rules are another way that regions can incentivise climate-friendly transport, for example, by encouraging innovation such as alternative fuels. Technology that communicates parking availability, travel routes, electronic toll collection, can cut down on congestion by 5% to 15% and on road fatalities by the same amount. Local authorities can expect to be fully involved in this emerging sector in the future. EU policymakers now recognise that the bloc will have to move to a circular economy in the future. The world’s resources are finite, and the global population is only going to grow, which means as little as possible can be wasted. Waste, in fact, must be seen as a valuable resource that can be recycled again and again before ultimately being burnt for energy. The European Commission is due to present its revamped package of waste, recycling and incineration laws before the end of this year. But that is just the first step in what will be a long process with a key role for municipalities. The collection and sorting of rubbish does fall under the remit of local authorities. It will be up to them to deal with the practical concerns and how best to address them. Should collection be tendered out to private contractors? What conditions are needed to create a vibrant market in waste? How can we move away from landfill? These are just some of the questions that regional leaders will have to face in the future, in addition to all of the social, health and environmental concerns around waste that already exist. They must invest in infrastructure, adapt regulatory frameworks, and ensure citizens are fully informed about the shift to circular. The Ellen MacArthur Foundation, which promotes the circular economy, recognises the vital role of cities. Cities offer greater proximity between stakeholders, be they citizens, retailers or service providers. This provides a key enabler for the development. Regional leaders must take into account how best to husband their land resources to boost the fight against climate change at local level. One of their biggest challenges is the threat posed by agriculture to the climate. That is recognised by Commissioner for Agriculture and Rural Development Phil Hogan and Neven Mimica, the Commissioner for International Cooperation and Development. Not only does agriculture contribute to climate change, it can suffer from it. There is strong evidence that changing temperatures and rainfall temperatures can damage crops. Agriculture is the second largest producer of global warming greenhouse gases. Gases like methane and ammonia are even more dangerous than CO2. A study by Germany’s Federal Environment Agency has warned that agriculture is doing enoromous environmental damage. There are hopes that the reform of the EU’s Common Agricultural Policy can drive the shift to sustainable farming. About €62 billion, is earmarked for the “greening envelope” of direct payments, and €50.4 billion from the Rural Development budget. Agricultural research and innovation is seen as key in meeting this challenge. Some regions plan to establish information networks to help spread the best practices, like Brittany's environment portal. This service gives citizens access to information like energy efficiency data or local nitrous oxide emissions per inhabitant. City planning can have a significant impact on climate change. Ever increasing urbanisation and the loss of trees and vegetation can increase net CO2 emissions. On the other hand, the naturalisation of urban spaces can bring real benefits, not least to the desirability and attractiveness of cities. Natural parks are increasingly popular, thanks in part to a hike in regional funding. The effective use of such “natural capital” both in and out of cities is increasingly on EU policymakers’ agendas. Environment Commissioner Karmenu Vella has overseen the distribution of EU funds to projects such as the UK’s Moors For the Future Partnership. The EU Life Programme handed out a record €12 million the Moors For The Future Partnership, the largest ever award to a British project. A further €4 million was also raised. It will pay to protect the internationally important blanket bogs of the South Pennine Moors in the north of England. Large areas of the moors have been devastated by air pollution and wildfires. Life is the EU's financial instrument supporting environmental, nature conservation and climate action projects throughout the EU. Since 1992, Life has co-financed some 4,171 projects, contributing approximately €3.4 billion to the protection of the environment and climate. In 2013, the EU adopted a strategy, aimed at promoting such green infrastructure. EU money will now encourage green solutions to infrastructure problems, such as allowing natural wetlands to absorb excess water from heavy rain, instead of building concrete flood protection infrastructure. Green infrastructure is promoted in areas such as agriculture, forestry, nature, water, marine and fisheries, regional and cohesion policy, climate change mitigation and adaptation, transport, energy, disaster prevention and land use policies. For regions to roll out the policies that will minimise climate change, they need finance. While some cash comes from national governments and other sources, European funds can also play an important role. But access to finance can be challenging. Critics blame the complexity of the funding process for a situation that leads to the biggest municipalities to take the lion’s share of cash. As well as sources such as the European Agricultural Fund for Rural Development, the European Investment Bank lends to projects. In 2013, the EIB spent €19 billion alone on financing projects tackling climate change worldwide. Of this, €2.2 billion was invested outside Europe, mainly in developing countries. The EIB is also disbursing the Junker Investment Fund’s €21 billion loan guarantees that aim to leverage €315 billion of private investment. While the European Fund for Strategic Investment (EFSI) does not focus exclusively on climate change, regions have already moved to earmark funds to mitigate its effects. On 19 May, the EIB announced EFSI funding for four projects. They include backing for energy efficiency investment to reduce heating bills of private homes in France; new renewable energy and related transmission links in northern and western Europe; reduction of industrial energy use in Finland; and improvement to gas transmission in Spain. The project to support energy efficiency investment in France will enable renovation work to cut energy bills in more than 40,000 homes. When successful projects get EU cash, the model is often replicated across Europe. In France, the regions of Brittany, Picardy and Midi-Pyrénées have all accessed the European Agricultural Fund for Rural Development (EAFRD) for very similar projects: converting old railways into 'green roads' for walkers and cyclists, and prioritising the protection of nature. A similar snowball effect could also occur for the new and innovative regional financing tool: green bonds. Several local authorities in France have already been tempted by this new means of financing renewable energy projects and climate-friendly infrastructure. As well as money being used to support green investments, funding is needed to soften the blow as carbon-dependent regions move away from polluting industries. Workers need financial support, as well as retraining, if their carbon-intensive industries are to be phased out as the EU shifts to a low-carbon economy. "In Paris there has to be a clear reference to the role of the local and regional authorities. It must be set out very clearly in the final text, not just in Europe, but in the developing countries as well," said Markku Markkula, president of the Committee of the Regions. “Cities are at the heart of the fight against climate change,” he said, “it’s where most of us live and where most of our energy is consumed,” said Climate Commissioner Miguel Arias Cañete. "We have a lot of towns today in the Southern countries, in Italy and Spain for example, that are really engaging and driving change. That is not to say that nothing is happening in the North, but it is maybe on a different scale, said Annabelle Jaeger, the author of a draft opinion on the COP 21 that was put to the vote in the Committee of the Regions on Wednesday 14 October. "Good practices are shared between local authorities, and many of these authorities are certainly carried by the collective dynamic. The regions that have really caught the bug are pulling the global movement forward. "The Covenant of Mayors committed to local sustainable energy is an initiative that has taken off above all in the South. This is a formidable European movement, but it is not the only one, and the European Commission should keep this in mind. What we lack is a real map of who does what, and where. Nobody is keeping track of this at a European level." "We’re doing our bit in cities. We’re encouraging people to walk and cycle, we’re improving public transport and urban freight logistics, and we have introduced low emissions zones and supported cleaner heating systems and more energy efficient buildings. But it’s not enough. The air in our cities is still too polluted, more polluted than EU legislation allows," said Anna Lisa Boni, the secretary general of EUROCITIES. "City governments need to play an essential role in supporting and enabling this transition, by looking at the benefits from a whole city perspective and providing the conditions for stakeholders to support this systemic change, for example by adapting regulatory frameworks, investing in infrastructure, providing (fiscal) incentives, supporting collaboration, or informing citizens," said Andrew Morlett of the Ellen MacArthur Foundation. Leonardo Mazza, senior policy officer for Biodiversity and Ecosystems at the European Environmental Bureau (EEB) criticised the new CAP. BirdLife Europe’s head of EU policy, Ariel Brunner, stated: “This review sadly confirms our analysis that the EU is failing on biodiversity, with agriculture as the outstanding disaster zone”. Robbie Blake, nature campaigner for Friends of the Earth Europe said: “Europe’s nature is in trouble. In failing to halt the loss of our butterflies, bees and birds, the EU and our governments are neglecting every citizen’s right to experience thriving nature. Website: Do the Right Mix intiative.